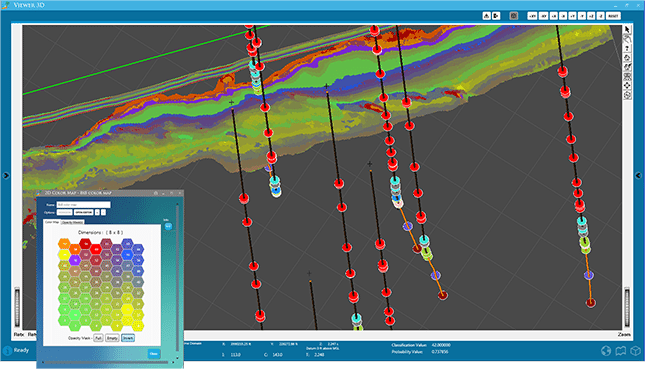 Paradise is a dramatic new geoscience analysis software featuring machine learning technology for oil and gas exploration and development. Seismic attributes provide a framework for interpreting geologic features that define depositional environments. The Paradise Attribute Generator guides interpreters through the process in straightforward ThoughtFlows™, making a large library of attributes readily accessible. Using the Advanced Attribute Library, interpreters can systematically generate seismic attribute volumes for multi-attribute analysis. Employ an array of instantaneous, geometric, and spectral decomposition attributes to extract more from the seismic response. The Advanced Attribute library is based on software developed by the world-class Attribute Assisted Seismic Processing & Interpretation (AASPI) Consortium at The University of Oklahoma. 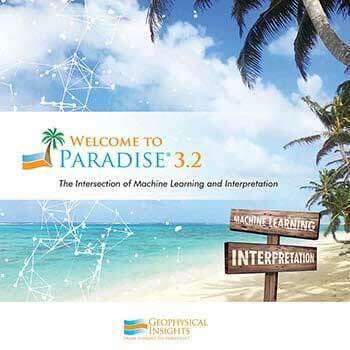 The Paradise Attribute Generator presents this powerful software in straightforward ThoughtFlows, making them available for all interpreters who use Paradise for attribute generation and analysis. Attributes differ in their relative contribution to information in a given volume. PCA is a method of identifying those attributes that have the greatest contribution to the data and quantifying the relative contribution of each attribute. The PCA workflow in Paradise is applied on the attributes to assess their relative contribution to the SOM analysis. The SOM is a neural network based machine learning process that is applied to multiple attribute volumes simultaneously. Applied at full seismic resolution in Paradise, the SOM produces a non-linear classification of the data in a region designated by the interpreter. Regions can be delimited by time, between horizons, or above and below a given horizon in Paradise. The interpreter uses the 2D Colormap to analyze SOM results. Each hexagonal object (neuron) in the interactive 2D Colormap represents a class of data in the region and a corresponding geologic condition. The SOM distills greater information from the seismic response by extracting more information from multiple attributes. Paradise is the only software product in the industry with a 2D Colormap representing neuron classifications of attributes. The 2D Colormap is used interactively with the Paradise Universal Viewer to select and isolate specific neurons which have classified a set of seismic attributes according to where data is concentrated. 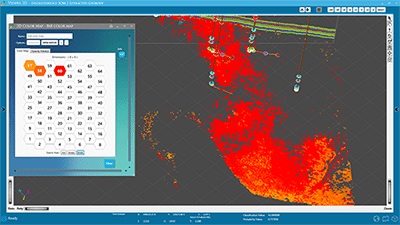 The Paradise 2D Colormap focuses on specific anomalies, discovering geologic features, stratigraphic features, high pore pressure, or direct hydrocarbons indicators (DHI’s). Paradise enables every interpreter to use powerful machine learning processes through straight forward, left-to-right guided ThoughtFlows™. 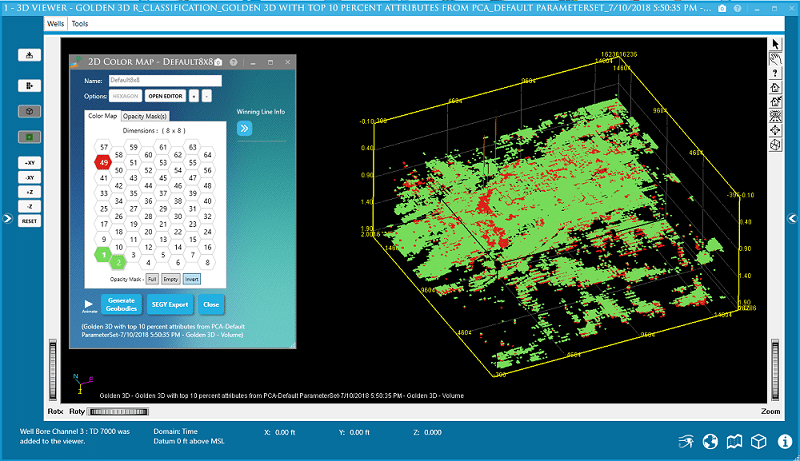 Click below to learn more about how to set up and generate a PCA chart of attributes and SOM classification results, then use the unique 2D Colormap with the 3D Viewer to interpret geobodies. 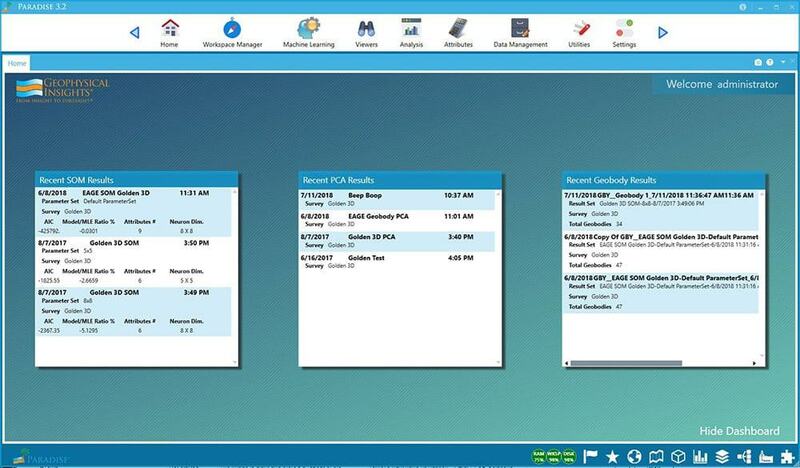 The Universal Viewer presents your SOM process results through classification and probability volumes. Using the unique interactive 2D Colormap, geoscientists can selectively isolate, visualize, and analyze each individual neuron. Specific features and anomalies can be investigated according to classification and probability results. 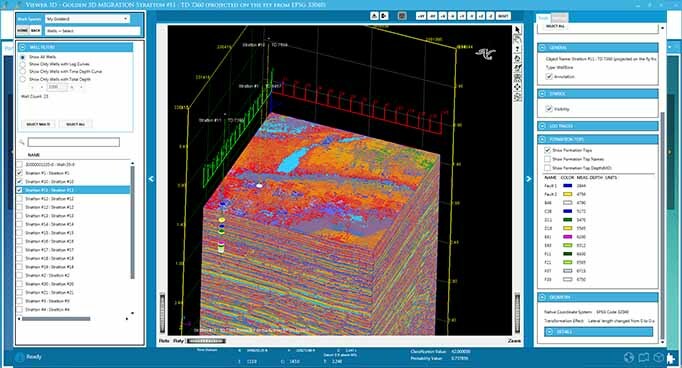 The interactive capability of the Universal Viewer and interactive 2D Colormap enables a faster and higher fidelity through a 360 degree view of the volume, thereby reducing exploration risk. The selected data objects in the Universal Viewer windows do not need to be reselected as the interpreter navigates between Universal Viewer, 2D Viewer, and the World Map. 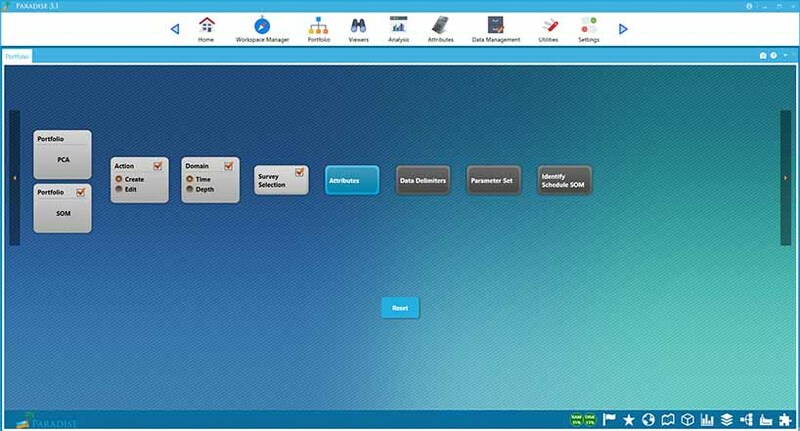 Data is selected for viewers from a single workspace navigation tree. Geobody generation and editing is an exciting part of the Paradise 3.2 release and unique to the Paradise machine learning platform. Geobodies are created from neuron groups selected from a Self Organizing Map (SOM), and are used to generate a three-dimensional visualization of a geological feature, such as channels, sand bars, deltaic formations, or any other area of interest. The number of Geobodies generated depend upon the SOM topology and the number of neurons originally selected. 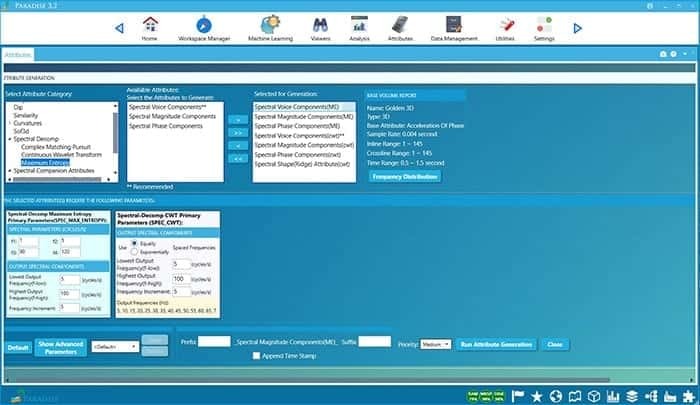 The dynamically updated Dashboard provides a convenient snapshot of work performed on specific portfolios, along with the corresponding SOM and PCA results, in an easy-to-view tabular form. Select an item to see the underlying details or return to a specific session to continue an analysis. Paradise is a global analysis platform that enables interpreters to declare specific Workspaces within a regional setting. Workspaces are defined by seismic data, attribute volumes, and analysis results within a polygon on a map of any shape and size. The powerful combination of the World Map and user-identified Workspaces supports collaboration among asset teams and JV partners alike. Results within defined Workspaces can be exported to other interpretation tools to share the classification results from Paradise. With the increase in the size of data volumes, traditional servers and workstations can limit the speed of interpretation. The new Paradise HPC capability enables the generation of geometricand spectral decomposition attributes on clusters of machines, dramatically reducing computation time. 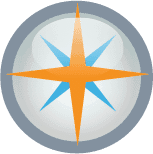 The Petrel connector allows Paradise users to import and export data from Paradise into and out of Petrel. Below is a list of the minimum technical hardware and software requirements for running a single instance of the Paradise client and server on a dedicated workstation. Contact us for more information regarding technical specifications on client/server installations. 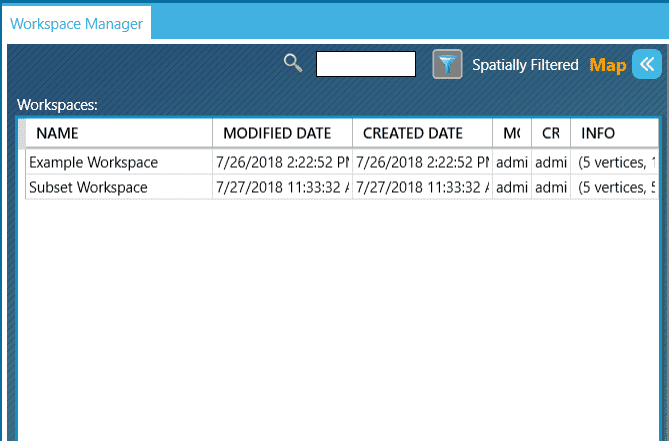 * File Storage capacity is dependent on the size of the surveys and attributes volumes, plus interpretation files, e.g., faults, horizons, wells, etc. Local storage (on the server running Paradise) is encouraged for evaluation purposes; however, if a centralized network storage facility is to be used for project files, a 10 Gb LAN connection is recommended between the target server and project file storage facility.